Carryings On Up The Dale: Poles v Ottoman Turks war game. Poles v Ottoman Turks war game. Robbie and John were up the other evening. Robbie brought his 'new' 28mm Ottoman Turks up for their first appearance under 'new ownership'. These figures used to belong to John 30-odd years ago. They were sold on but left unused for many years then bought back by Robbie a few months ago who has since added to them and 'Tartared' them up. It seemed fitting that their first engagement should be against my 17th century Poles. 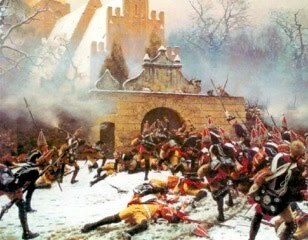 I know my Poles are very tough and the Winged Hussars especially are pretty unstoppable, but almost half the army is made up of (not ineffective) Cossack light cavalry, so my Winged Hussars and supporting Pancerni would have to be husbanded and released at the right moment in order to wreak havoc among the dastardly Turks before being whittled down by shear attrition! (Which is what nearly happened). We had agreed to field equally pointed-up armies :-( based on the values outlined in army lists in the 'Pike and Shotte' rules which are our favoured set. I'm not a big fan of army lists, especially ones that are too generic, cover too wide a timespan, or just inaccurate or just designed around a particular set of rules, but at least we got a 'balanced' game. The Polish army was made up of three divisions. The left and right divisions were each made up of 2 Winged Hussar units, 2 Pancerni units and 3 Cossack light cavalry. The centre was made up the same, but with one less Cossack unit but instead had 4 units of Polish infantry and a medium gun. My commander in chief was rated 8 and the other commanders were all rated 9. The Turks field a veritable sea of men and horses; lots of light cavalry and levy infantry, some fanatic swordsmen, several units of decent musket men, two solid blocks of Spahi (about 8 units in total I think) and 5 or 6 units of Janissaries. Oh, and lots of guns, all heavy or medium beasts. Sadly the Turkish commanders were not so brilliant as although the commander in chief managed a randomly-generated rating of 9, the others were all rated 7. I got to move first and both my flanks advanced (too) slowly towards the Turks. My centre failed their command roll so stayed put. The Turk's first move was pretty bad as most of the units failed their command rolls as well. Above, the battlefield from the Polish right wing. In the distance thousands of 'orrible Turks arrayed against my too few brave sons of Poland. Below: Feudal Spahis on the Turkish right who failed almost every command roll until the Poles had crossed the table. Above the static Polish centre and below the more energetic right flank sweeps towards the Turkish grand battery and rank upon rank of Janissaries. Above, at last and led by their bear mascot the Polish centre advances, well the cavalry do, as the infantry decide its safer to stay where they are. Below, those same Feudal Spahis and Akinjis rooted to the ground. To be fair the latter did engage in melee with my Cossacks and later tried to outflank me by going through a wood in the centre of the battlefield where they got lost, and the Spahis did mix it with my Hussars towards the end of the game. Above, the Polish left flank about to descend upon the Turks in front of the them. 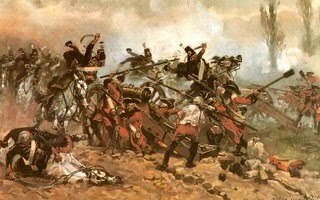 They managed to drive off or shake most of the light cavalry and infantry, rode over the gun and caused serious damage to the Spahis. Robbie's right flank command was broken, but still able to fight, as I found out when one unit of Winged Hussars overextended themselves after following up too enthusiastically, and were broken after being charged by a unit of Spahi who didn't seem to know their command was broken. 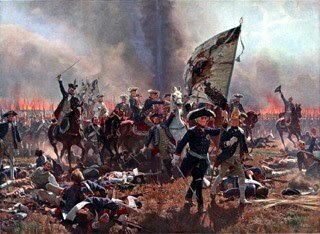 Above, the Polish infantry. 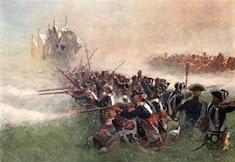 They did finally advance reluctantly towards the village and exchanged shots with the enemy. A unit of my Cossacks threw a blunder and charged some Turkish infantry hiding behind a fence, breaking them in the process. Below, the Turkish centre finally gets moving. Thats the end of the photos as I got so engrossed in the game that I completely forgot to carry on. In the centre I tried to close with Robbie's grand battery and supporting infantry but failed, and while my Cossacks soaked up most of the bullets, cannon balls and arrows heading our way the Hussars did take some damage, and at times were halted through disorder when, being elite, I failed to recover them at the start of my turn. Robbie tried to hit one of Hussar units in the flank with his Delhi fanatic horsemen but I was able to turn to face and drive him off. 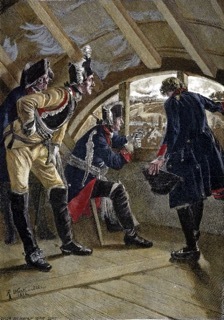 By the time we had to stop it was utter confusion in the centre as although I had been successful in destroying loads of Robbie's lower class infantry and cavalry I'd not yet closed with the Janissaries or the Spahis of the Porte who were hiding in the rear. 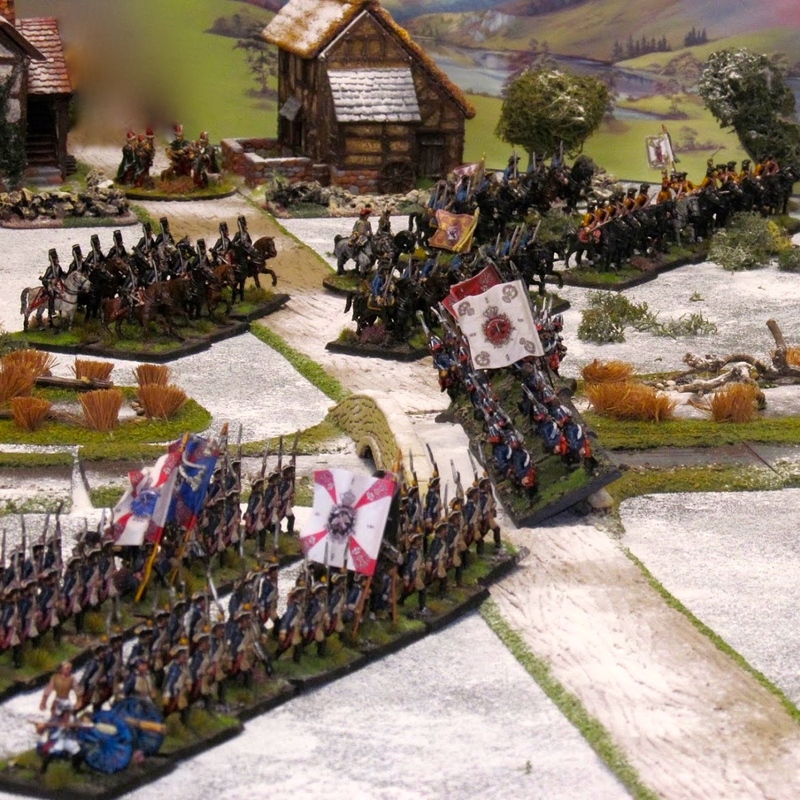 I had only lost one unit if Cossacks in the centre and most of the Hussar and Pancerni were relatively unscathed so who knows what might have transpired if we'd had the time for more moves. I do suspect that I might have died gloriously on the spears or under the swords of the Janissaries, as there we're more of them than us! My left flank had, for the loss of a unit of Hussars, destroyed or driven off the entire Turkish right hand division but it would take time for me to bring them over to support the centre, especially as several units were shaken and would need time to recover. The Turks conceded defeat after what was a thoroughly enjoyable and frustrating game. The Winged Hussars did what they do best and overall I made some well-timed saving throws, which was just as well considering the amount of lead and cannon balls they seemed to attract, while the Turks' movement was hindered by poor commanders which left them dangerously close to the baseline when it came to hand to hand combat. What a colourful and spectacular game! A real treat! Winged Hussars and vividly colorful banners. Very handsome Polish cavalry force you have. A good looking game Colin - well done.